When you know you need help, but you’re not sure what the best kind of help is, try exploring Windows 7’s Help and Support Center. For Windows 7, Microsoft has expanded the Help and Support Center coverage with more tables, charts, updated information from the Web, and step-by-step instructions for you to follow. Choose Help and Support Center from the Start menu to open the Help and Support Center. The Help system offers three options. When in doubt, start at the top and work your way down. How to Get Started with Your Computer offers advice on setting up a new PC for the first time. Learn about Windows Basics provides an overview about Windows 7 tasks. 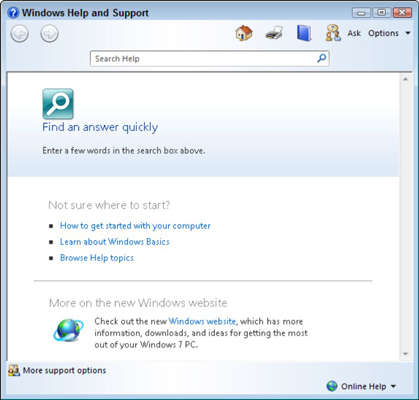 Browse Help Topics leads you to an interface where you can whittle your way through large categories to find detailed information about the operations of Windows. More on the New Windows Website: This takes you directly to Windows 7’s online Help page, which is sometimes more up-to-date than the built-in program. Be sure you’re connected to the Internet before you click here. Navigate through the Windows Help and Support program the same way you would through a browser or folder. To move back one page, click the little blue Back arrow in the upper-left corner. That arrow helps you out if you’ve backed into a corner.